Sherpa 120 Adventure kit is one tough portable solar panel unit that was definitely born hard off the beaten path. I love this small portable solar kit and take it with me to some of the most remote places in America. Goal Zero is working everyday to continue to deliver smart innovative affordable portable power solutions that will change the way you travel. Trekking the Grand Canyon or spending a weekend climbing in the Mojave Desert near Joshua Tree, there is never electricity when I travel. The Sherpa 120 Adventure kit starts with the Nomad 27 watt portable solar panel. The Nomad 27 is a mono-crystalline solar panel, well actually several small solar panels, that provide plenty of power that folds into a compact portable pack. Peaking at 18 volts with 12V +/1 2v charging power, the Nomad 27 is powerful enough to get the job done charging the Sherpa 120 power portable battery pack in about 6 hours depending on the sun, angle and location. The Nomad 27 portable solar panel weighs in at just 3.4 lbs and folds down to 10.5 x 7 x 2″ something I have no problem fitting in my backpack. 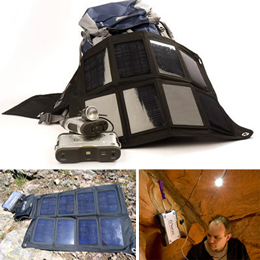 Next on my list of favorite portable solar panel products is the Goal Zero Sherpa 120 power battery pack. This compact portable battery holds a whopping 120 watts of power storage that you can then plug in your small electronics with a USB or DC outlet. The lithium iron phosphate batter has and extended life of between 2,000 and 3,000 cycles which is roughly equivalent to 70,000 AA batteries. The LCD status monitor keeps track of how much battery power you have left. The Sherpa 120 portable battery also has built in electrical protection to keep from damaging the unit during charging spikes. Last but certainly not least is the Sherpa UI universal inverter. Goal Zero Sherpa universal inverter will provide up to 100 watts of continuous power and 200 watts peak or surge power. An inverter takes DC electricity and converts it to AC power. Goal Zero has taken a basic electronic product and redesigned it to a lightweight inverter that can easily be switched between 110V to 220V anywhere. This durable versatile design allows you to power commonly used electronic devices such as laptops, cell phones, or GPS. Can be used from any 12V cigarette adapter such as your car or boat. Blue Pacific Solar has complete this custom portable solar panel kit by adding a small LED light. I don’t know about you, but when I am living off-grid for any length of time, nights are dark and the solar girl appreciates all the lights I can get my hands on when I am fumbling around a tent in the dark. This portable solar panel kit sells for about $730 and ships anywhere in the lower 48 for free.